Libby's Little Addiction: September My Monthly Hero - Release Blog Hop + Giveaway! September My Monthly Hero - Release Blog Hop + Giveaway! It's time for another My Monthly Hero release, and this month the theme takes a fun twist on all things autumn. The main kit features beautiful Chinese lantern plants, among other images. The bright orange lanterns are gorgeous for fall! 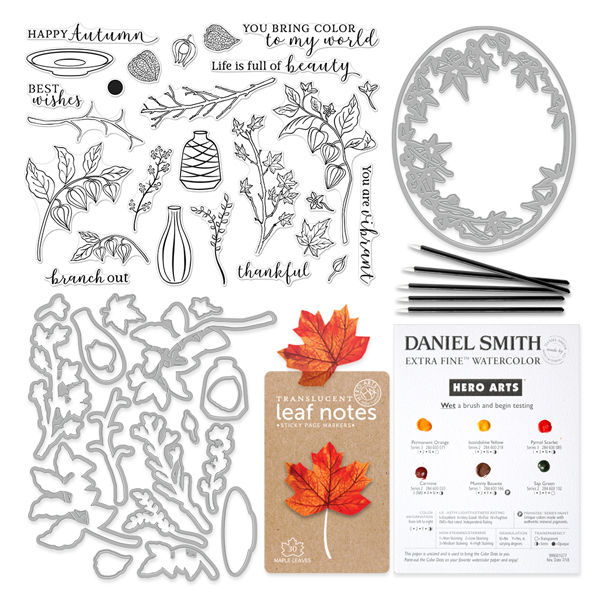 I began with my kit by stamping out all of the images on watercolor paper, and just painting them in with the Daniel Smith dot card, included in the kit. It's amazing just how far those little dots can go when watercoloring! Once dry, I die cut the images and arranged some of them on my card, popping up the pieces. Here's a look at the entire amazing kit. It's so pretty - definitely on my list of all-time favorites! I also made several cards used the optional add-on products. For this next card, I began by painting a very vibrant background using the brand new Orange Liquid Watercolor (which is so gorgeous!!) along with Dandelion and Cocoa. I stamped out the images from the stamp and cut set and again just painted them all in, using the liquid watercolors mentioned above along with Moss, Pine and Strawberry. After die cutting, I arranged them on my watercolored background, accenting with sequins from the Champagne mix as well as a strip of glitter cardstock. The next card features the absolutely gorgeous new Ornate Floral Stencil. 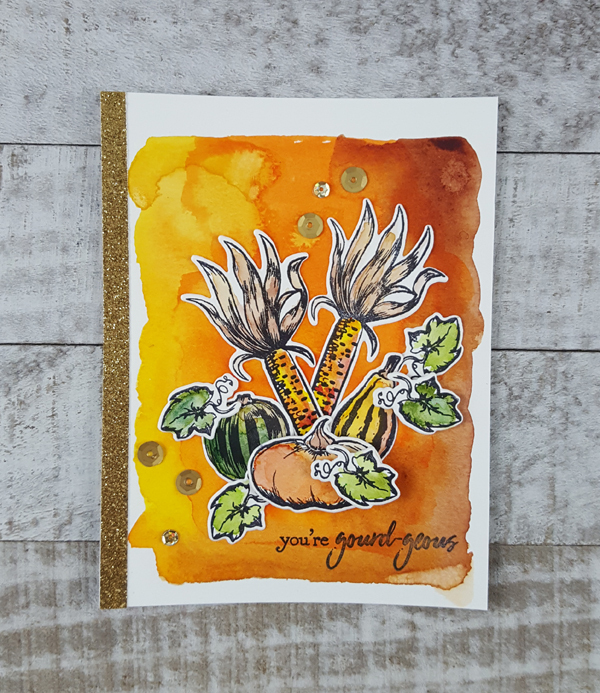 To create the background for this card, I mixed a bit of Nuvo Glimmer Paste on my craft mat along with a few drops of the Orange Liquid Watercolor. I smoothed this paste across the stencil using a palette knife, and set aside to dry. The Nuvo paste dries quite quickly, so I immediately washed my stencil. 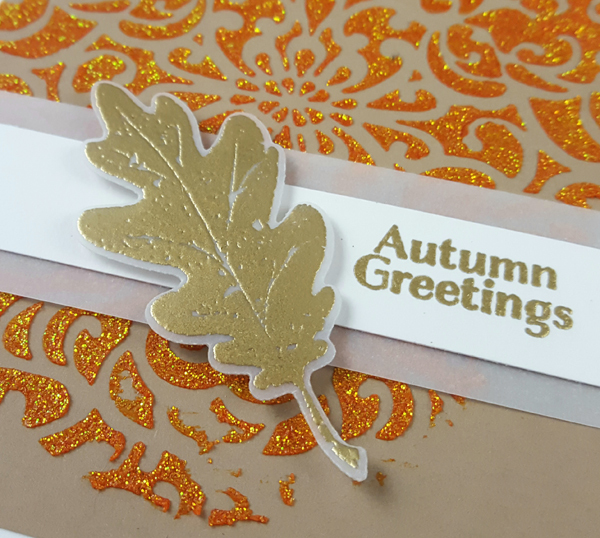 The accent on this card is an oak leaf from the Textured Leaves set, embossed in gold on vellum. The "autumn greetings" message is from the new Autumn Moon stamp set. Here's another card featuring stamps from the Autumn Moon set. These were stamped, die cut and colored with Copics. 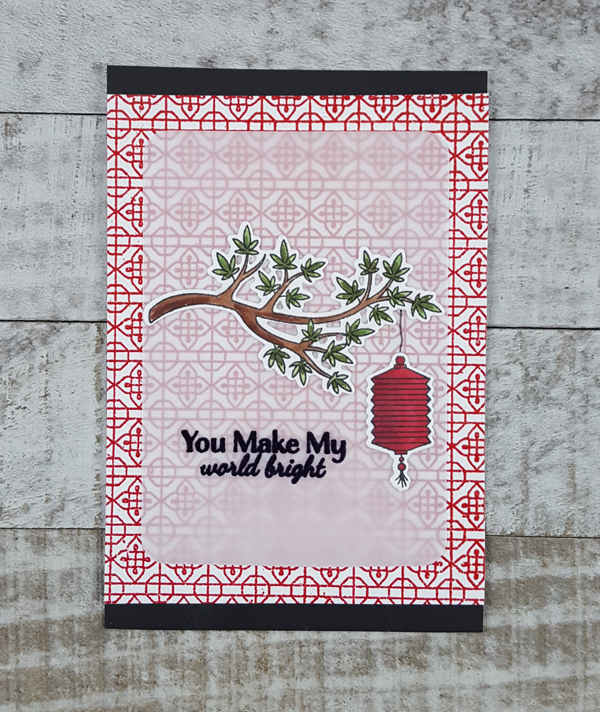 That gorgeous background is the new Patterned Lanterns Bold Prints, embossed with the fun new Red Embossing Powder. And finally, a card using the new Cloudy Moon Fancy Die. These fun clouds were die cut from watercolor paper, which I added color to using liquid watercolors in Indigo and Purple. I added a little Black to the clouds, watered down quite a lot to be more gray than black, and then covered them with Star Dust Stickles. 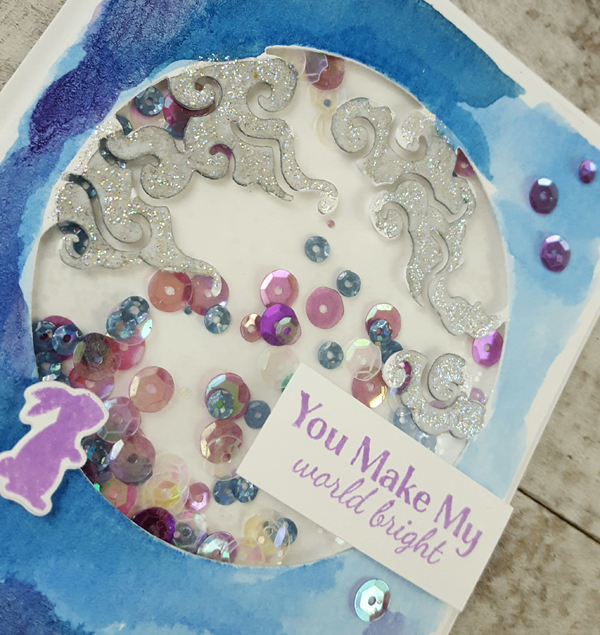 I stamped the sweet little bunny from Autumn Moon in Orchid ink, and created a shaker card filled with Ombre Purple sequins. Now it's time to hop! There's so much inspiration from these bloggers, be sure to check it all out! And like every month, there's a giveaway - be sure to comment on every blog in the hop, and a lucky winner drawn from the comments will receive a free kit! The winner will be announced on the Hero Arts blog. Comment by Sunday night, September 9th! SO much to love here! I loved the colors of the first few and then the use of the vellum. Thanks for sharing your creativity and such a wonderful product! Your cards are beautiful!I am in love with this kit! Looking forward to receiving it! Beautiful cards and a wonderful kit and add-ons! Love all the beautiful cards from this Hero Arts Kit. I need to get some Nuvo Glimmer paste and that stencil! This is fun....everyone is going all out and doing multiple cards.....it’s great! Super cards!!! Beautiful cards, love the Asian theme with this kit! i think i like the addons almost better than the main kit. that bunny!!! that cloudy moon die!!! i mean, really!!! Such wonderful cards you've made!! I want to thank you for the time you've put into this hop to inspire us. Kudos! Amazing projects from an amazing kit! Thank you. Love the cards and how each are so unique. All of your cards are beautiful! I love the Chinese lanterns! Thanks for all the great inspiration! Love your cards! Great inspiration and wonderful work! Thanks! So pretty! Your cards are wonderful and this looks like a great new kit from Hero Arts. Fall colors are my favorite. Thanks for sharing with us!! Libby what beautiful cards you've created!!! OMG! I love all of them! The simplicity of the first one and the backgrounds are to die for! Beautiful work and the colors are amazing. Love them all! I love all your fun cards, Libby! There is so much color and warmth, and they all look amazing! What STUNNING cards!! I love the colors you chose-so warm and festive!! Gorgeous cards! Your use of color is fabulous and I would cherish any of these cards! 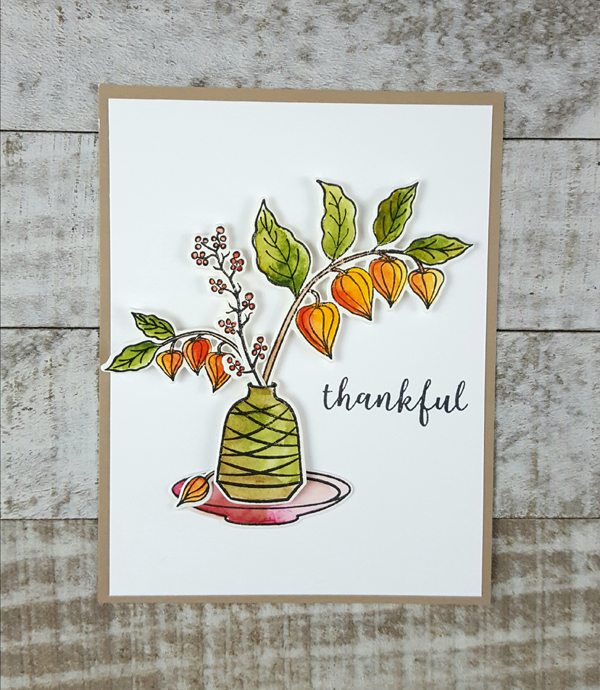 Love the dimension on the first card thought -- I'm a sucker for anything popped up! You've worked hard to make the abundance of cards, which show the beauty of a few different sets. My first notice was of how brilliant the colors are in your painting using the Daniel Smith watercolor dots. Gorgeous....all of your creations. Thanks for showing so many cards from the whole release! Your cards are so fun and pretty. Love the shaker one. Your cards are lovely! Love everything fall themed! Lovely cards! These cards are helping me get in the mood for Fall. Love your cards! Did you know that Japan doesn't have a "man in the moon" like we do? They have a "rabbit in the moon"! Love that card most! Really beautiful cards! 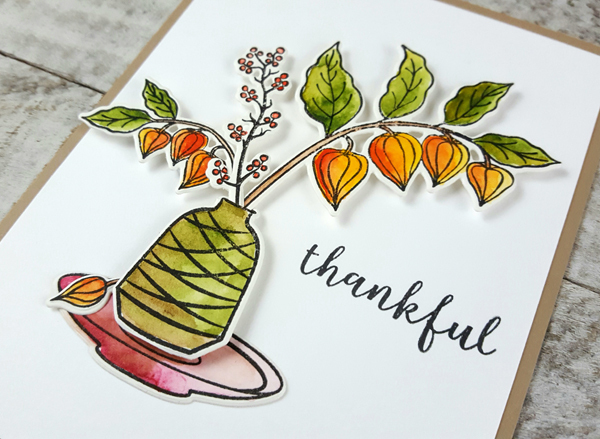 I have to say that the "gourd-geous" card and the Autumn greeting card are my faves! Both backgrounds are stunners! I didn't know you could mix the glimmer paste with anything, so thanks for the inspiration! Libby these are beautiful cards - I love your style of card making, and the way you are using new (to you) techniques on your work, like the water colour background on the final shaker card. That wee bunny was the perfect touch there! Gorgeous cards. Loving all the examples made from this kit. Wow!!! Fabulous cards!! Love so much your wonderful colouring technique!!! Love the simplicity and pop of the first card Libby - all are great! So much fab eye candy! Every one is lovely and the gordgeous pun still has me smiling. Beautiful cards. I love the fall colors and unique styles. Wow what creative cards!! Love the one with the autumn floral stencil and the orange glitter paste! Great job! Great cards! Great kit! Great add-ons! Such beautiful cards! Awesome kit. Thanks for the inspiration . Beautiful cards! Beautiful cards ! This kit looks amazing! Lovely cards using the new kit! Wow those are some really great looking cards! Love what you did with the gourds and the red lantern card! I love the new set and all of the creative ideas! Great kit, great add-ons and great cards. Thanks for sharing. Love your beautiful examples! That moon die is so intriguing. Awesome cards, Great new products! 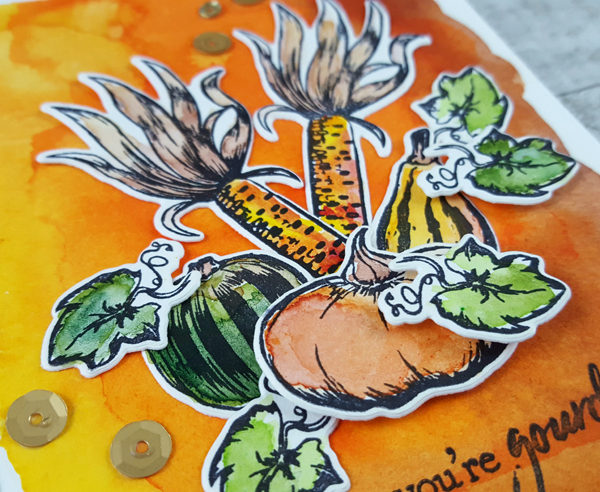 I especially love your background for the fall vegetables card! Wonderful cards from this awesome kits. Thanks for showing the versatility of is. I especially love the first card. I have never use watercolor before and recently bought all my supplies to do it for the first time. Now that I see what a beautiful job you did with the paint that comes with the kit, I feel encouraged and motivated to give it a try for sure. Thanks for the inspiration. 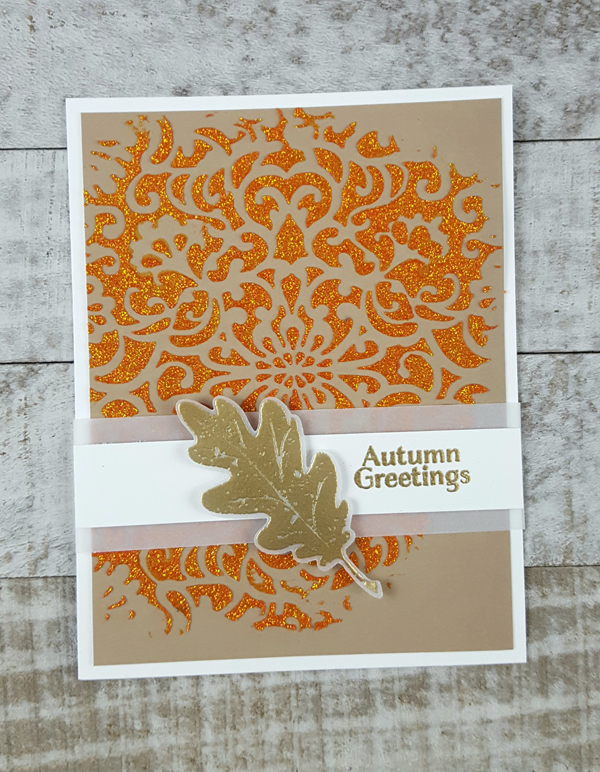 I love your Autumn card and the way you used the beautiful stencil. The watercolor dots look like a lot of fun too. Can't wait to play! This months kit and add ons are awesome! I love the Asian/fall feel to them. Your cards show the versatility to perfection! Gorgeous cards! What an amazing kit! Amazing collection of cards! Fantastic designs and techniques. That’s a beautiful set of cards you’re offering us ! Within this variety of style, the one with the vegetables is my favourite. Your cards have beautifully showcased these new products. Thanks for sharing your creativity. I love fall and this kit! You design team members amaze and inspire me every month!